1. I am relieved to report that Annelise's playdate Tuesday afternoon went well. Thanks for all your advice and talking me down off the play date ledge. They were all giggly and silly when I picked them up after school, their excitement was infectious. 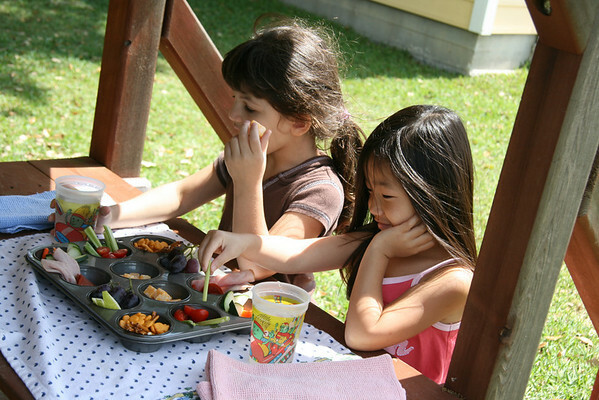 After a cloudy, drippy morning, the sun finally came out and the girls had a muffin tin picnic. Since I had never served lunch in such a fabulous way before, A. declared, repeatedly, that I was a GENIUS. Well, thank you. I realized I may have gone a little overboard with the variety, but it worked out because they nibbled on it in phases. Their few giggly hours together were spent playing outside, jumping on the trampoline, playing in her room, going on a June bug scavenger hunt (E. found 13, A. found 9, plus one roly-poly) and playing her Littlest Pet Shop game. Whew! 2. I finally gathered my wits about me earlier this week and managed to send out a bit of Good Mail. That felt good! I've been rather negligent (okay, lazy) in that area lately, so I hope this was a spark to ignite that habit again. 3. Is it just me, or do you think Valerie Bertinelli's face looks completely different too? Enough to bug a person. I think it's fantastic that at 48 she has lost weight and toned up (hope springs eternal), but has she nipped/tucked her face too? 4. 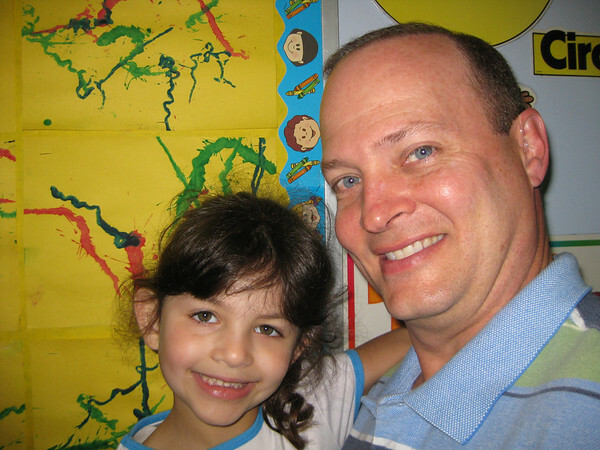 Last Friday morning was Dads and Donuts at Annelise's school. She was THRILLED to have Scott drive her to school and sit in her class room with her. I was THRILLED to stay in bed. 5. We survived dance class photos this week, thank goodness. I'm not sure why it always seems like such an ordeal, especially since she is only in one costume (older girls are in more dance numbers). I guess I always worry we'll forget something or have attached something wrong, though we haven't yet. Can you guess what she is? Yeah, that's right (those dangly things are stretchy sequined strings that will attach to her tap shoes so she'll seem more puppetesque). I do hope she doesn't develop identity issues from dancing a tap routine in drag at such a young age. Hope your Friday is FABULOUS. Hooray for the successful playdate! Your muffin tin picnic looks great, I really must do that some time. 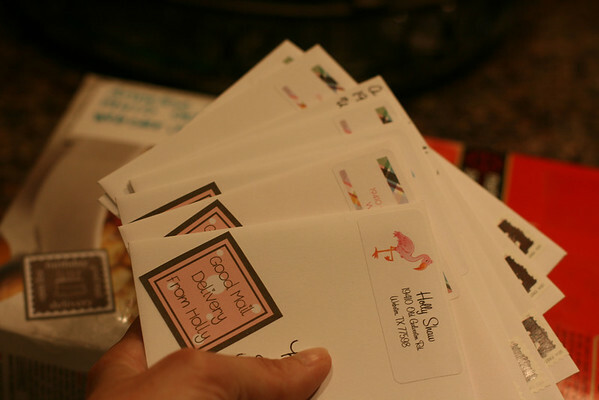 I'm so happy to see that lovely stack of good mail going out! I think Valerie looks great. I assumed her face was different because she was so much thinner and is perhaps wearing false eyelashes. I hope she didn't have surgery because that takes the hope out of it for the rest of us. I am totally copying that muffin tin holder lunch idea. Genius. ya- valerie looks great- but did they photoshop her face?? she looks more normal in commercials, as far as the face goes..
Dance photos- why are they so hard? they just are. Cute costume there! 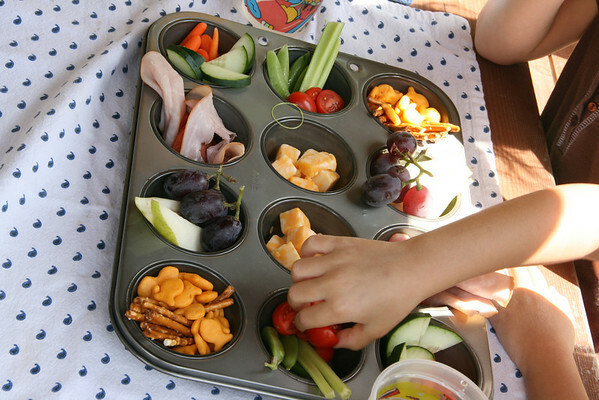 Your playdate muffin tin lunch is so cute. PQ is sitting right beside me and she's sick and miserable, but she perked up when she saw that and said, "Ooh. That looks good!" I might just have to do that! Valerie's face does look different, but I was wondering if it was Photoshop since she doesn't seem to have the puffy slug lips that seem all trendy in Hollywood. A looks so cute in her dance costume! Shouldn't leave her with any baggage at all. Love the pics and the updates! Have a great weekend! I didn't even recognize Valerie. Gosh, you know what? I didn't think it looked weird at all. Maybe I'm just not very observant. I am sure they had to photoshop her tummy, though. I'm sorry, but no one has that kind of a stomach at that age and after childbirth. I'm so glad you survived the play date. It wasn't so bad afterall, huh? glad the playdate went well! the picnic looks great! 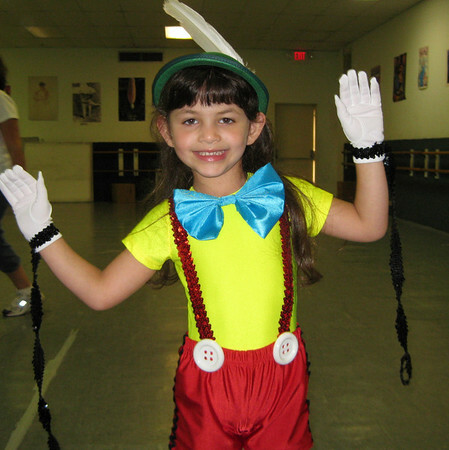 even my husband said "Pinocchio" for A's dance costume! I would love to be invited for a playdate at your house! I'd nibble all that muffin tin goodness and borrow your People magazine. ok, so can you make ME a muffin tin?! seriously- that looked really good. and yes- i think her face looks odd to me, too. the whole thing kinda bugs me. and what a cute dance picture!!! Maybe they just airbrushed the fat right off her face. Sigh . . .